NASA's Aqua satellite passed over Tropical Storm Nangka after it made landfall and was moving into the Sea of Japan. Nangka caused the evacuation of over 200,000 people and caused flooding as it made landfall. It is now weakening and expected to dissipate in a day or two. Nangka made landfall near Cape Muroto on Shikoku Island late Thursday (local time). It then tracked over Japan's main island of Honshu with wind gusts to (78.2 mph) 126 kph according to the Japan Meteorological Agency. 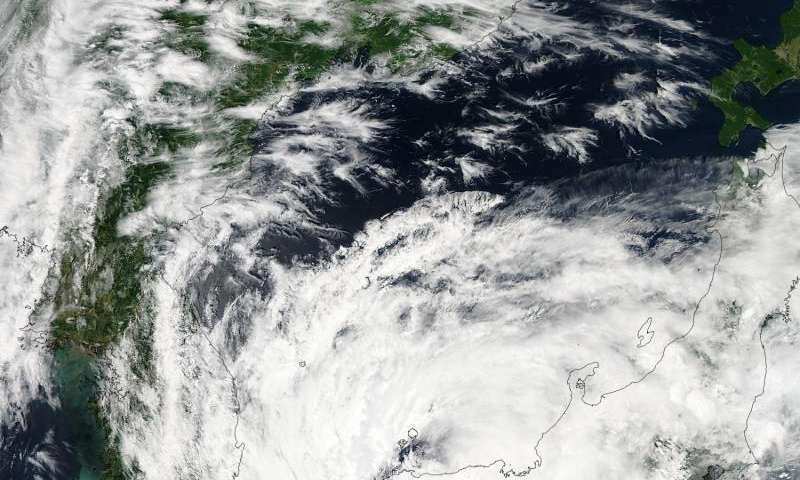 By Friday, July 17 at noon (local time), Nangka was moving near western Japan's Tottori Prefecture and into the Sea of Japan when NASA's Aqua satellite passed overhead. The MODIS instrument aboard Aqua captured a visible image of Nangka at 04:25 UTC (12:25 a.m. EDT) that showed the center near the Tottori Prefecture and south of Dogo Island. Bands of thunderstorms still wrapped around the center and stretched over the Sea of Japan and Japan. The eastern-most edge of Nangka was brushing South Korea. At 1500 UTC on July 17, Tropical Storm Nangka's sustained winds were down to 35 knots (40 mph/62 kph). It was centered near 36.1 North latitude and 134.0 East longitude, about 180 nautical miles (207 miles/333.4 km) west-northwest of Camp Fuji, Japan. It was moving to the northeast at 9 knots (10.3 mph/16.6 kph). The Joint Typhoon Warning Center forecast calls for the storm to dissipate over northern Japan in the next day or two.